Peanut butter cup inspired Chia Pudding. Mix together the night before and wake up to a delicious, fiber filled, nutrient packed breakfast! You see those chia pudding jars right up there? About 2 minutes after taking that picture I was wiping globs of chocolate + peanut butter chia pudding up off of the floor because my nutjob of a cat tried to jump up on the precariously placed ‘table’ I have set up to take my food photography. In fairness to Mabel, it wasn’t exactly a stable steady set up. I like to take my food photos in my bedroom because we get the best light. My photography set up is really just an Ikea desktop balanced on the window ledge and stack of pillows piled on top of a little table to keep it straight. Super professional, yes? Mabel was able to jump up on the desktop for all of about two seconds before everything went tumbling to the floor and she went flying out of the room like a bat (or cat?) outta hell. If it wasn’t so funny looking I might have been a little annoyed at the loss of a perfectly good chia pudding. She just looked at me with that dumb face afterwards as if to say, ‘what’s your problem, human?’. I’ve grown up with dogs all my life, but I’ve come to learn that there is a special kind of chaos that is reserved for cat owners and it usually involves glassware falling from tabletops. Now let’s talk chia pudding! Thank goodness for Costco and affordable bulk buying because these little pudding pots have become a morning staple for Mike for the past couple of months. Aside from the fact that it’s loaded with chocolate and peanut butter I love the fact that it takes all of 5 minutes to throw everything together in a jar, mix it up, and store it in the fridge until morning. Ready made breakfasts are ? I guess another reason I can’t be upset at that little thug you see pictured above it because it’s easy enough to whip up another chia pud in a flash. The most difficult thing making this is the fact that you need to wait at least 2-3 hours for the seeds to do their thing and gel up before you can eat it. But really, I think what most people love the most when it comes to chia pudding is the fact that it’s a breakfast pretending to be a dessert which also happens to be extremely energy dense. Chia seeds are full of fiber, protein, antioxidants, and healthy omega 3 fats. What better way could you start your day than with something that’s as nutritious as it is decadent? 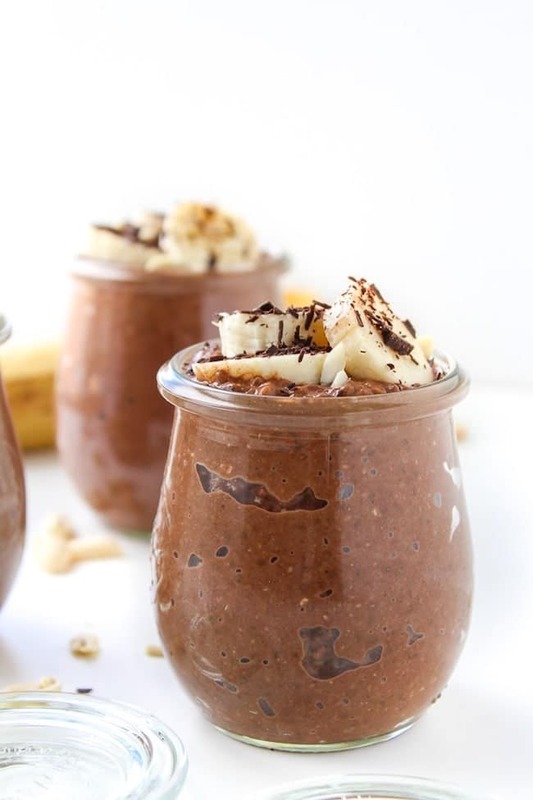 Don’t forget to #asaucykitchen on instagram if you this Chocolate Peanut Butter Chia Pudding! I love seeing what you make! You can also post your pictures to my facebook page! I can’t wait to make this and I want to lose weight and cut carb too. Would it be possible to make a batch of this and leave it in the fridge for, say, a week? I’ve never made Chia pudding before and this recipe was amazing! So easy to make and so tasty! I’m looking for healthier options for breakfast or snack, and this is a great choice. Thank you for sharing your recipe! I’m so glad you liked it! Thanks so much for coming back to let me know what you thought! Yay! So glad you liked it! Thanks so much for coming back and letting me know what you thought! I was wondering if the nutritional info is for 1/2 of the recipe or one serving of the recipe? Also I used my emulsion blender to mix this, that’s acceptable right? ( I love that tool!) My husband is trying to gain weight and this may just be one of those extra healthy snacks or breakfast additions to help him. Thanks for this recipe! Oh I used cashew butter because of a slight peanut allergy. This is my all time favorite breakfast to date, mostly because CHOCOLATE!! I mean, who doesn’t like having dessert first thing in the morning?! I’ve recently discovered chia seed pudding and I love it!!! I’m always excited to find new recipes for it. I can’t wait to try this! I hope you like it! Chia puddings are the best! I think I’m gonna sub pb2 for peanut butter and add on mct oil to give it an energy boost. My 1st time making a chia pudding and this recipe was soooo much better than I expected, really tastes like I’m eating dessert for breakfast 🙂 Thanks for sharing! Yay! So glad you love it – thanks so much for coming back to let me know what you thought! I made this but used chunky peanut butter and it was delicious! Chunky peanut butter is always a good idea! So glad you liked it! Just made these for my afternoon snack at work. The mixture tastes divine! Can’t wait to make my work mates jealous tomorrow!! Ha! Love it! Thanks so much for coming back to let me know what you thought! I used unsweetened almond milk and stevia, and my nutritional info was a bit different (good for less carbs!). Thanks for this recipe! I’m so excited to dig in! Ooh thank you for including that – I’ve seen a lot of people on insta trying it with alternative sweeteners like stevia so I know that’s going to be super helpful to some! I just made this. I can hardly wait to taste it tomorrow. Does the carb count include the sliced banana? Trying to cut the carbs. Nope – just the chia pudding on it’s own! Did you use crunchy peanut butter or smooth.? Some people say to melt before how would I do that ? Cant wait to make this. Hi Rachel! We normally used smooth, but you can definitely use crunchy if that’s more your thing! If you wanted to melt it to make mixing easier you can do it by heating it up in the microwave and set it for 30 seconds – that should heat it up enough to be easy to stir and mix. You can also do that on the stove top – just put it in a small sauce pot and warm on a low heat for 1-2 minutes. Make sure you keep stirring so it doesn’t burn on the bottom. Will the peanut butter powder work as well? My apologies if this was already covered. Since the peanut butter is mostly just used for flavour in this recipe peanut butter powder should work! Can this be made with regular dairy milk, or do chia seeds work best with dairy free? You can use any type of milk you’d like with chia seeds! Thank you for sharing the most deliciuos pudding recipe ever! Im new to chia seeds and wasnt sure about it, and im extremely glad and happy i did! IT IS SUPER YUMMY my whole family loved it! Now making a new batch! Thanks a million! Yay! So happy you guys enjoyed it! Hey! Random Q but where did you get those jars? I’ve been looking for them for a while now to add to my prop list. Thanks! Do you think it would work with ground chia? I haven’t tried it myself but I’m pretty sure it would work. I know chia eggs are usually made with ground chia seeds so I don’t see why it wouldn’t gel up here as well! 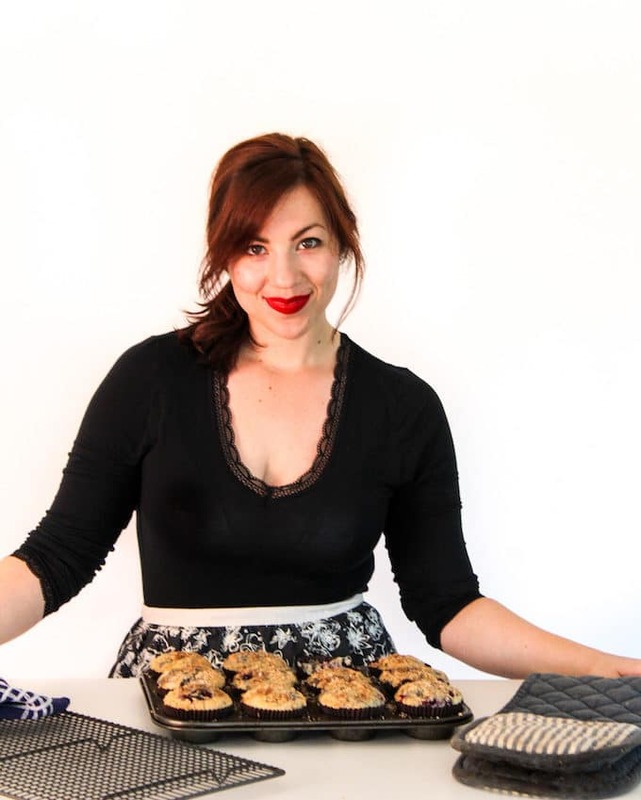 I just made this recipe & its amazing! But I was wondering how long it can stay in the fridge?? Yay! glad you liked it 🙂 These should keep in the fridge for at least 4 days! Delicious!! Made this this morning and it was a big hit for both my fiance and myself. Hi Ashleigh! You should get 2 servings out of this (about 1/2 cup for 2). So glad you both enjoyed it 🙂 Thanks for coming back to leave a review! Yay! That makes me so happy to hear – Chocolate and peanut butter really is the best way to start the day 🙂 Thanks for coming back to leave a comment/review! Hearing things like this makes my day! Seriously good! I topped mine with cacao nibs and. Amanda and it was delicious and filling! Will definitely make this again! So good had it today for breakfast with sliced banana. Will definately make again. Ooh yay! Glad you enjoyed it, Laura! Thanks for coming back to leave a review! Altogether it makes a little over 1 cup which would make the servings about 1/2 cup. It might sound like not very much, but since there’s so much fibre it’s pretty filling. Hope that helps! Delicious – made a glas for my mother and I for breakfast.. Very positive experience! We do a lot of chia-puddings, but rarely add anything else but chia and almond milk. My mother loved the cocoa! So glad you guys liked it! We also usually find ourselves making the same chia puddings everyday, but since Mike is a certified chocoholic it’s usually just chocolate. It’s nice being able to switch things up! Thanks for coming back to leave a comment! This was my first foray into chia pudding and it was much better than I expected! I put some cashews on top for added crunch. Thanks for the recipe! Ooh love that idea! So glad you liked it! 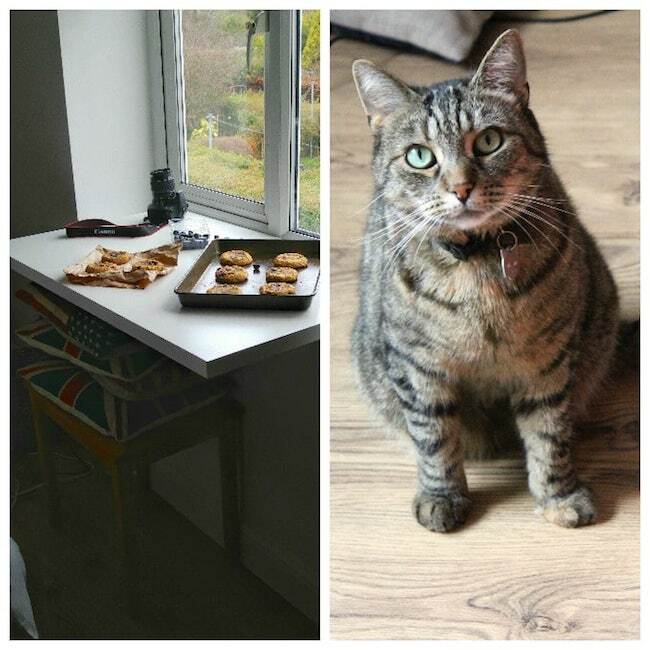 My dog would also always try to sneak a treat but since dogs are heavier and not as light footed as cats, she didn’t jump up on any table or higher surface. Thanks Stella! We have a dog named Stanley who’s always trying to get a taste of pretty much anything. It’s a good thing he’s short because he tries to stand up and see what we have on tables. He’s just barely able to reach his nose up – as long as there’s nothing too close to the sides he can’t get it. Pets are the best! 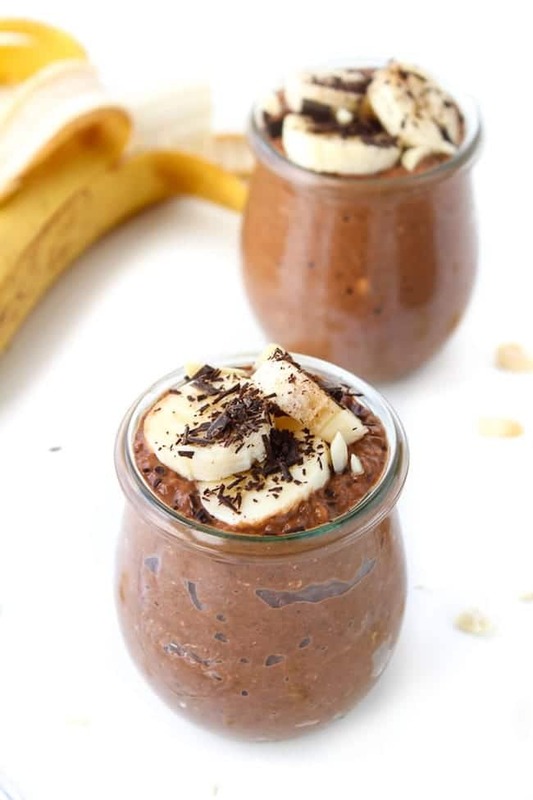 This chia pudding looks really good! Definitely going to try it out, pinning and sharing! Thanks Sara! I can’t get enough of anything peanut butter and chocolate related! Peanut butter, chocolate AND bananas? Yes yes yes! Don’t worry about Mabel, a few days ago I was outside photographing muesli for a client which I’d set up with nuts and dried fruit everywhere as they wanted. I had to run back inside to grab an ingredient I’d forgotten and when I came back out I had a very suspicious looking Trixie and a pile of dates had definitely moved. Turns out little madame shoved them around with her nose as she gave them a good sniff whilst I was away. dessert for breakfast is always a winner in my book!! 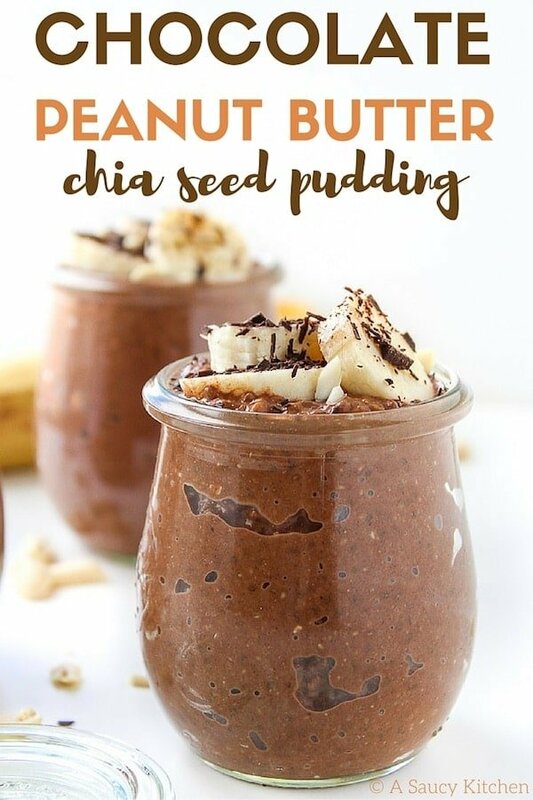 I love chia pudding, chocolate, and peanut butter–so this is perfect for me! Thanks Kristen! Chocolate + peanut butter forever! Thank you! Things with kitty’s always get me too!